In 2006 a Yale medical student, Jason Andrews, and his Nepali wife, Roshani Andrews, traveled to Nepal to document the HIV crisis in rural areas. They were shocked to discover that the need for healthcare extended far beyond HIV infection. The region had zero doctors for over 250,000 patients. Even the most basic medical needs were not met. Possible was established to combat the healthcare crisis the Andrews saw on their trip. Two years later Possible transformed a grain shed into its first functioning clinic. Since then, Possible has served more than 235,000 patients and grown a strong network of healthcare workers. They work with the Nepali government, consistently diversify their revenue streams, and make technology a top priority to ensure the vulnerable population they work with has access to the healthcare they deserve. The organization illustrates how the right nonprofit technology can accelerate impact. 1. Technology lets you focus on your mission and get things done. Technology allows nonprofits to automate processes and work more efficiently. Ultimately this gives your staff more time to focus on what really matters: your constituents. “If I had to send donations receipts all day, that would be a full time job,” said Laura. 2. Technology allows you to engage donors in creative ways. Technology enables nonprofits to display impact in real-time, share campaign progress to donors, and compel supporters to act. 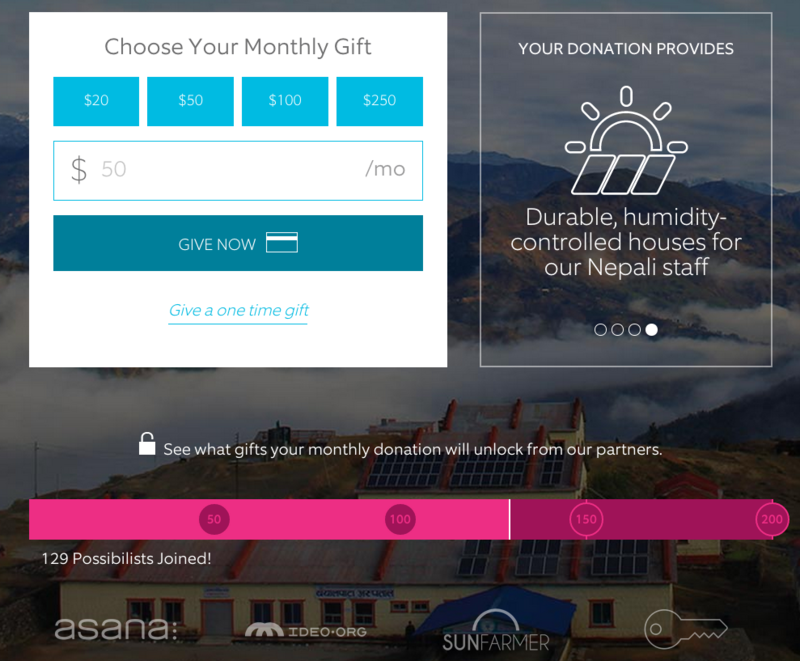 Possible used the Classy APIs to create an engaging microsite for their recurring giving program—Possibilists. Since launching the campaign on December 2, 2014, they’ve grown annual recurring revenue 218 percent. 3. Technology puts data to work for you. Whether you need to better understand your programs’ impact or you want to convert one-time donors into recurring donors, software like Classy and Salesforce allows you to run reports for every situation. The ability to build out more effective programs has huge positive implications for your constituents. Possible uses Classy’s reports to turn one-time donors into recurring donors and to upgrade donors. They constantly explore new and creative ways to use reports and have recently adopted the Classy-Salesforce integration to gain even more insight into donor and impact data. 4. Technology empowers your staff, no matter where in the world they are. The majority of Possible’s staff works in Nepal. The means communication can be a challenge. Possible uses Asana, a team communication application, to manage projects and enable the entire team to always be the same page. This technology allows the organization to work as a global team and focus on efficient and effective project management. 5. Technology enables you to raise more money. The right tools do help you raise more money online. A solution that makes it simple for supporters to donate to or fundraise for your organization, share your cause, and attend events is an investment with a return. Classy helped Possible become more efficient with fundraising. Automated receipting and a simple donation process that yields few support questions from donors have allowed them to focus more on their mission and experience year-over-year growth in online giving. 6. Ultimately, technology is an investment with a tremendous ROI. Although implementing technology does take work and perseverance, the benefits far outweigh the challenges for organizations that embrace it.